Most people have become familiar with the cat mantra, “If it fits, I sits.” But what about trying to fit on top of a narrow doorframe? 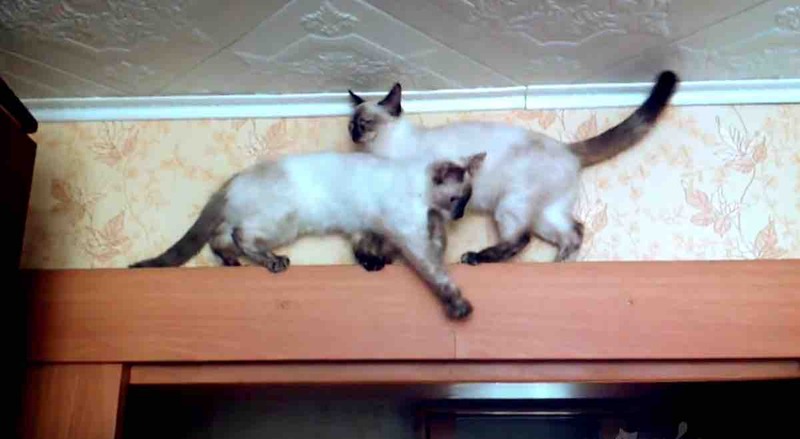 Well, that’s exactly what these two Siamese cats were caught doing in the most recent feline video to charm the internet. Both of the acro-cats can be seen facing each other on top of a thin ledge in a woman’s household. As they both try and bypass each other in order to get to the other side of the frame, they can be seen jostling uncomfortably in the middle of their balancing act. Though some animals may have called it quits, the two felines eventually find a way to slip past each other in a sufficiently elegant – albeit amusing – fashion.